Lindsay Platt is a native of Cleveland, Ohio and a graduate of Butler University, where she received a degree in Arts Administration and studied voice with Dr. Steven Rickards. Her love of music began at age five, when she persistently asked her parents for a violin. Since that time, Mrs. Platt has interwoven her love of music with the desire to find ways to provide musical experiences for all. Mrs. Platt has worked in nonprofits and music throughout her career, with positions in fundraising, teaching, administration, and programming. 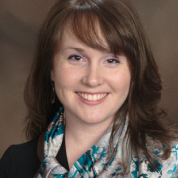 She most recently was the Associate Director of Development and Education at Heartland Sings. Mrs. Platt is a regular performer, having performed with the Indianapolis Symphonic Choir, The Cleveland Orchestra’s Blossom Festival Chorus, and Heartland Sings. Since 2004, Mrs. Platt has performed in a variety of recitals in Indianapolis, Cleveland, Okinawa, Chicago, Louisville, and Fort Wayne. She currently cantors and sings with the choir at the Cathedral of the Immaculate Conception. Mrs. Platt is member of the Alliance of the Isaac Knapp District Dental Society, Sigma Alpha Iota, and Music Teachers National Association. Mrs. Platt has been married to her college sweetheart, Joseph Platt, for eleven wonderful years.